Israeli Prime Minister Benjamin Netanyahu will seek cabinet approval on Sunday for a contentious release of 104 veteran Palestinian and Israeli-Arab prisoners, to coincide with the resumption of peace talks. The planned releases have brought protests from Israeli victims' families and from Netanyahu's hardline coalition partners. "This is an incomparably difficult decision," he wrote. "It is painful for the bereaved families, it is painful for the entire nation and it is also very painful for me." There were rumblings within Netanyahu's own right-wing Likud party too, with deputy defense minister Danny Danon urging the party's ministers to vote "no" in Sunday's cabinet session, which begins at 0700 GMT. "I say that this is a diplomatic mistake, a moral mistake,' he told public radio. "The message we are giving the terrorists is that, at the end of the day, we are freeing them as heroes." Qadura Fares, head of the Palestinian Prisoners' Club which tracks the well-being of Palestinians in Israeli jails, said on Sunday that there would be no talks unless all 104 prisoners returned to their homes. "If they don't free all of them, there will be no negotiations," he told public radio. "Expulsion is punishment," he said. "These people. who are now over 50 years old, all of them sick, need to be released to their homes." A cabinet briefing paper said the government saw approval of the new draft as "urgent and important" and said it would be asking parliament to fast-track its passage into law. 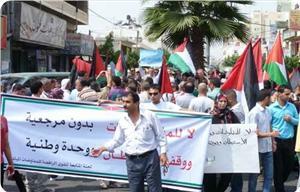 Hundreds of Palestinians marched in Ramallah on Sunday to protest a return to negotiations with Israel. Demonstrators marched from the city center towards President Abbas' headquarters in the Muqata, chanting slogans condemning the Palestinian Authority's decision to return to talks. Four PA police officers and three protesters were injured when both sides clashed during the march, which was organized by the Popular Front for the Liberation of Palestine, a Ma'an reporter said. Addameer prisoners group said dozens of protesters were injured by police, adding that PA forces were arresting injured demonstrators at public hospitals. Palestinian Legislative Council member Khaled Jarrar was assaulted by a policeman during the clashes, witnesses said. In Jerusalem, dozens of Israelis gathered outside the government complex to protest Israeli premier Netanyahu's decision to release 104 Palestinian prisoners, Ynet reported. The demonstrators chanted: "You do not release murderers of children" and "Bibi is a coward." Leader of the Jewish Home party Naftali Bennet joined the protest, calling the proposed prisoner release a "disgrace" and saying "terrorists should be eliminated, not freed," Ynet reported. Netanyahu was seeking cabinet approval on Sunday for the release of 104 veteran Palestinian and Israeli-Arab prisoners, to coincide with the resumption of peace talks. The start of the meeting was delayed for over an hour, as Israeli media said Netanyahu sought to win over opponents within his own right-wing Likud party. Israeli and Palestinian negotiators are to meet in Washington on July 30 for a round of talks after a three-year break in peace negotiations, a Palestinian official said on Saturday. The Palestinian delegation would be led by chief negotiator Saeb Erekat with the Israelis headed by Justice Minister Tzipi Livni. US officials will also take part. The cabinet is convening Sunday morning to vote on the release of 104 Palestinian prisoners as a gesture to the Palestinian Authority ahead of the expected resumption of US-brokered peace talks. Ahead of the vote, relatives of Israelis who were killed in terror attacks gathered outside the government complex in Jerusalem to protest against the release of prisoners. The protesters chanted: "This is a day of mourning," "You do not release murderers of children" and "Bibi is a coward." 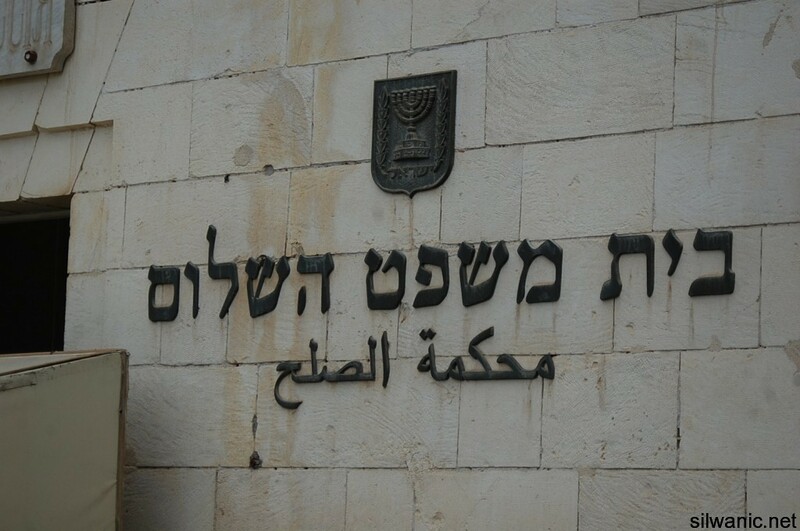 They handed out the private phone numbers of the ministers to passersby, urging them to call the ministers and ask that they vote against the release of Palestinian prisoners. According to Prime Minister Benjamin Netanyahu's proposal, the prisoners will be released at stages as the peace negotiations progress. The proposal further states that a ministerial committee headed by Netanyahu will finalize the details of the prisoners' release at a later stage. 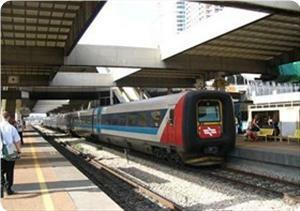 The cabinet is expected to approve the proposal. Apart from the premier, the ministerial committee will include Defense Minister Moshe Ya'alon. Justice Minister Tzipi Livni, Internal Security Minister Yitzhak Aharonovich and Science and Technology Minister Ya'akov Peri. "This is an incredibly difficult decision. It hurts the bereaved families, it hurts all of the Israeli people and it hurts me very much. 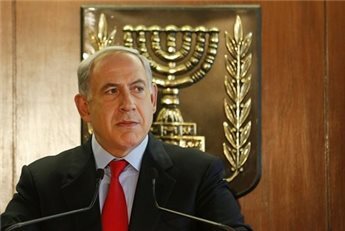 It clashes with the most important principle, the principle of justice," Netanyahu said Saturday in an open letter to the citizens of Israel explaining his decision to release Palestinian prisoners. "Sometimes prime ministers are forced to make decisions that go against public opinion - when the issue is important for the country," he said. "Our best response to the loathsome murderers who tried to terrorize us into submission is that in the decades that they sat in prison, we built a state to be proud of," Netanyahu said in the letter. Addressing the upcoming start of peace talks, the PM said that "in the next nine months we will determine if across from us is a Palestinian partner that desires a true end to the conflict as we do." Speaking on condition of anonymity, the official told AFP that the Palestinian delegation would be led by chief negotiator Saeb Erekat with the Israelis headed by Justice Minister Tzipi Livni. US officials would also take part, he added. The sides are expected to meet for an informal dinner on Monday evening, he said. Israel's Regional Development Minister Silvan Shalom said this week that talks could resume next Tuesday, but neither the date nor venue have so far been confirmed. Livni, Israel's designated chief negotiator, will reportedly be accompanied by Prime Minister Benjamin Netanyahu's personal envoy Yitzhak Molcho. "According to senior officials in Jerusalem, the meeting in Washington is expected to deal primarily with the agenda for holding negotiations, including the subjects to be discussed and the timetable," according to Haaretz newspaper. On Saturday, both Haaretz and public radio reported that Israel was expected to release more than 100 Palestinian prisoners in stages during the talks, expected to last for six to nine months. An Israeli official said this week that the release of "around 80" long-serving Palestinian prisoners was being considered. The agenda for Sunday's weekly cabinet meeting says Netanyahu will tell ministers about the resumption of the talks, and also ask them to task a ministerial committee on "the release of Palestinian prisoners during the course of negotiations". It did not give a number. 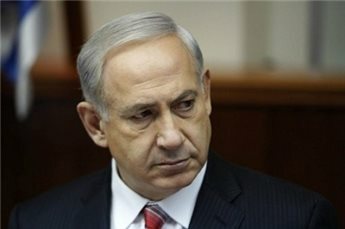 Israeli news website Ynet said that Netanyahu would head the prisoner committee, which would decide which prisoners would be freed and the timetable for their release. The cabinet is also set to endorse a draft bill which would submit any peace treaty with the Palestinians to a referendum. A briefing paper published by the cabinet office said the proposal comes "in light of the significant diplomatic developments accompanying the opening of negotiations by the state of Israel with the Palestinian Authority". The cabinet paper said the government saw approval of the new draft as "urgent and important" and said it would be asking parliament to streamline its passage into law. United States Secretary of State John Kerry called President Mahmoud Abbas late Friday, presidential spokesman Nabil Abu Rudeineh said. Kerry told Abbas that US President Barack Obama and his administration fully support quick return to negotiations, said Abu Rudeineh. Kerry succeeded last Friday in getting the Palestinians and Israelis to agree to resume talks in Washington as a first step toward starting direct negotiations stalled since 2010. Prime Minister Benjamin Netanyahu said on Saturday that Israel will free 104 Palestinian prisoners to coincide with the resumption of long-stalled peace talks brokered by the United States. "I agreed to free 104 Palestinians in stages, after the start of negotiations and according to progress," he wrote on his official Facebook page. He did not give details on those to be freed or confirm reports that talks would open in Washington on Tuesday. A Palestinian official earlier told AFP that the Washington meeting would be attended by chief PLO negotiator Saeb Erakat, his Israeli counterpart Justice Minister Tzipi Livni and US officials. The sides are expected to meet for an informal dinner on Monday evening, on the eve, he said. "At this time, it seems most important to me that the state of Israel enter (negotiations)," Netanyahu wrote. "This is important both to maximize the possibility of ending the conflict with the Palestinians and to solidify Israel's position in the complex international reality surrounding us," he added, writing in Hebrew. Haaretz newspaper said the initial talks would be to lay the parameters of formal negotiations. "According to senior officials in Jerusalem, the meeting in Washington is expected to deal primarily with the agenda for holding negotiations, including the subjects to be discussed and the timetable," according to Haaretz. Sunday's weekly cabinet meeting will hear a formal statement from Netanyahu on the resumption of peace talks and mandate a ministerial committee to handle the prisoner release, the government website said. The cabinet is also set to endorse a draft bill to submit any peace treaty with the Palestinians to a referendum. Jewish settlers on Friday expanded a settlement outpost built on Palestinian lands in the town of Khedr near Bethlehem to the south of the occupied West Bank. Ahmed Salah, coordinator of the Popular Committee against the Wall and Settlement in Khedr village, told Quds Press correspondent that a group of settlers began on Friday morning to build two new settlement units in Sidi Boaz outpost built on Palestinian lands in Kheder village. He said the settlers constructed two new buildings on the outskirts of the town in violation of the decision of the Israeli Supreme Court to stop construction work in the area. Dr. Mustafa Barghouthi, Secretary General of the Palestinian National Initiative (PNI), said that Israel’s railway plan is its ultimate attempt to annex the West Bank. The Israeli Civil Administration's approval to go ahead with the railway plan in the West Bank targets foiling any Palestinian attempt to establish a Palestinian state on West Bank territories, Barghouthi said. He stressed that the Civil Administration's decision came in total disregard to the PA and the peace process and negotiations. The railway plan is part of the Israeli racist policy in addition to the Apartheid wall, checkpoints, bypass roads, and the unfair military laws, he added. MP Barghouthi stressed the need to address this Israeli racist plan through heading to the International Criminal Court, and not to negotiations. The Israel Civil Administration revealed on Wednesday the grandiose railway plan that links all West Bank cities with one another and the Israeli settlements. The plan includes 473 kilometers of rail with 30 stations on 11 lines and dozens of bridges and tunnels. The Israeli government will increase the number of Palestinian prisoners set to be released as part of a gesture to the Palestinian side to resume peace talks, Israeli radio said Saturday. The number of prisoners released is set to increase to 102, a report on Israeli radio said. The issue will be addressed by Israel's government on Sunday. Israel may free Palestinian prisoners who hold Israeli citizenship, as well as prisoners held on criminal charges, the report added. Earlier this week, an Israeli official said around 80 long-serving Palestinian prisoners would be released. "The prisoner releases will start when talks commence," the Israeli official told AFP on condition of anonymity. "We're talking about releasing them in stages." There were "some 80 prisoners" set to be released, all of them "pre-Oslo," the official added, referring to Palestinians imprisoned before the 1993 Oslo peace accords. 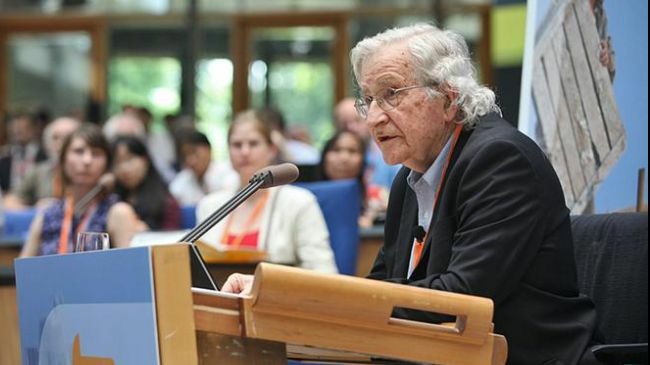 Renowned American academician Noam Chomsky says the United States cannot act as a mediator in the talks between Israel and Palestine because it is not neutral. He told reporters Friday in Geneva the US-brokered resumption of talks between Israel and the Palestinians likely will not amount to much, but Europe could change that if it were willing to break from American policies supporting Israel. Preliminary talks are scheduled to begin in Washington on July 30. Europe “consistently follows the US stand,” which punishes Palestinians whose land is settled by Israelis, and “there’s no reason why Europe should support illegal settlements,” he noted. The presence and continued expansion of Israeli settlements in the occupied Palestine has created a major obstacle for the efforts made to establish peace in the Middle East. A report released in May revealed that the Israeli regime confiscated 1,977 acres of the Palestinian lands in the occupied West Bank for its settlement activity during 2012. The settlements, which cover an area roughly equal to 1,035 soccer fields and twice as big as New York's Central Park, were approved by “military order,” according to the report by the Israeli daily Haaretz on May 27. The report said most of the new settlements were located deep in the Palestinian-inhabited West Bank. The United Nations and most countries regard the Israeli settlements as illegal because the territories were captured by Israel in the war of 1967 and are hence subject to the Geneva Conventions, which forbid construction on occupied lands. 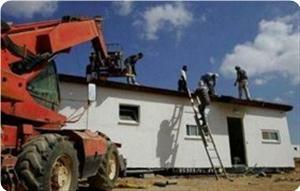 Israeli occupation authorities issued on Thursday evening building permits for 40 new settlement units to expand the settlement of Pisgat Zeev, north of occupied Jerusalem. Researcher in settlement Affairs Ahmed Sub Laban said in a press statement on Friday that these units are part of the settlement project which was approved in 2007, pointing out that it will expand Pisgat Zeev settlement towards the town of Enata, which is separated from the settlement by the Israeli segregation wall. 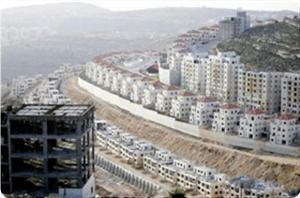 Sub Laban said these successive steps in approving settlement projects and building more units clearly prove the occupation authorities' neglect to calls for freezing the settlement construction in Jerusalem. "These steps raise questions about the fate of the city of Jerusalem and Jerusalemites in light of talk about a return to the negotiating table, especially as the occupation administration continues to ignore Palestinian demands," the researcher added. 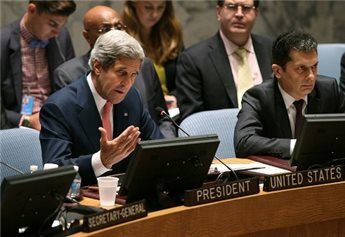 US Secretary of State John Kerry presides over a meeting of the UN Security Council on July 25 in New York City. US Secretary of State John Kerry appeared to have flubbed his lines on Thursday when he referred to Palestine as a country. Speaking at the United Nations ahead of talks with UN chief Ban Ki-moon, Kerry praised the "courageous decision" by Israeli and Palestinian leaders to try to resume direct negotiations. "It's my hope that that will be able to happen as procedures are put in place by both countries in order to empower that," Kerry told reporters. The US does not recognize Palestine as a country, although the UN General Assembly admitted Palestine as a non-member state in November. The US had opposed an earlier Palestinian attempt to join the UN as a state in the Security Council. State Department deputy spokeswoman Marie Harf assured reporters later that US policy had not changed. "Our position has not changed not on the status of the Palestinian territory. The secretary was in no way indicating a change of policy," she said. The government is not expected to approve a list of Palestinian prisoners to be released on its weekly meeting, sources involved in the issue said. According to them, the government will agree to form a ministerial committee composed of Prime Minister Benjamin Netanyahu, Defense Minister Moshe Ya'alon, Justice Minister Tzipi Livni and Internal Security Minister Yitzhak Aharonovich , who will handle any future prisoners' release. "There's still no real list of names," an Israeli official said. "Even the Palestinians didn't pass an ordered list." Israel is willing to make "very serious territorial concessions" in order to reach a peace agreement with the Palestinians, International Relations Minister Yuval Steinitz said. In an interview with The Telegraph, published Friday, Steinitz said that a "demilitarized" Palestinian state was the "only possible solution" to the conflict. "At the end of the day, we will have such a situation. It’s going to be difficult to achieve it - there are many obstacles in the way - but I think there is no other solution to the problem," said the minister, who is a member of the ruling Likud party. Israel and the Palestinians are expected to resume peace negotiations in Washington next week. "We are prepared to make considerable concessions and it’s not going to be easy," Steinitz told the British newspaper. "Both sides will have to make very significant concessions and very difficult concessions. We will probably have to make very serious territorial concessions. And the Palestinians will have to make also both territorial concessions - because there will be settlement blocks - but more important still they will have to recognize the very existence of the Jewish people and the Jewish state." The minister said the Palestinians will also have to abandon the "right of return" for Palestinian refugees who were left Israel during the war of 1948. As for Jerusalem, which the Palestinians claim as their capital, Steinitz said the status quo was the only option. "We are ready for a two states for two people solution," he said. "If we reach an end of conflict peace agreement with the Palestinians, we will have a referendum. I can tell you, I am confident that most Israelis will support it - even if we will have to make considerable and difficult concessions, including territorial concessions. But on one condition: that Israelis will be totally convinced that what we are getting in return is genuine, enduring peace and real security." Addressing Iran's nuclear ambitions, Steinitz told The Telegraph that President-Elect Hassan Rohani had "cheated" the West when he led negotiations over the nuclear program a decade ago. While making paper concessions, Iran pressed on with developing its nuclear facilities. "He (Rohani) is cunning, he's charming and he will smile all the way to the (nuclear) bomb unless the Western world will do everything necessary to stop him," said the minister. The West, added Steinitz, should send Iran a "clear message" by stating: "You want to save the Iranian economy? Give up the nuclear project. You want to continue the nuclear project? You will destroy the Iranian economy and even expose yourself to potential possible military attack. There is no third way, nothing in between. No middle way." Israeli and Palestinian negotiators could sit down for face-to-face peace talks as early as next Tuesday, according to an Israeli cabinet minister. Speaking earlier today, Israeli energy minister, Silvan Shalom, told a meeting in the West Bank city of Jericho that he hoped officials from both sides would meet in Washington next week. "We hope that the talks between Israel and the Palestinians in Washington will begin next week, hopefully Tuesday," he said. "We want and are interested in moving forward in the negotiations and meanwhile see an improvement in the Palestinian economy." According the Haaretz newspaper, an Israeli official later confirmed Shalom's comments – the first direct negotiations for almost three years. Palestinian sources were less confident, however. One senior official in Ramallah told The Independent that the Washington talks would begin on Tuesday only if the Israelis provided assurances that the 1967 border between Israel and the West Bank was the basis of territorial discussions and that all Palestinian political prisoners jailed before the 1993 Oslo peace accord were included in a planned prisoner release. "If we receive this assurance by Sunday, then we will sit down on Tuesday," he said. Last weekend, Yuval Steintz, another Israeli cabinet minister and confidant of Israeli prime minister Benjamin Netanyahu, indicated that "some" prisoners would be freed: "There will be some release of prisoners. 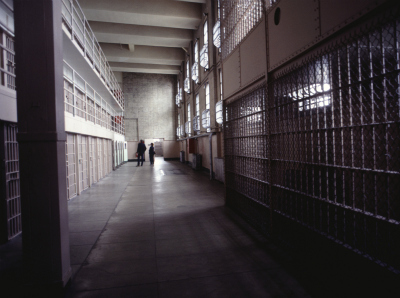 I don't want to give numbers but there will be heavyweight prisoners who have been in jail for dozens of years." The Palestinian official accepted that the prisoners would be released in stages, but was adamant that Israel give an undertaking that all prisoners would be released. There are 103 pre-Oslo prisoners in total. Some reports last week suggested that Israel was prepared to free 80 of them, despite internal opposition. When US Secretary of State, John Kerry, began his diplomatic effort to restart the moribund peace process in March, he was adamant that there would be no pre-conditions for talks. However, it is understood that he gave a personal assurance to Mahmoud Abbas, the Palestinian Authority President, that 1967 borders would be the starting point for negotiations. It is unclear just how advanced the deal between the two sides is. Last week, Kerry said he had brokered, "an agreement that establishes a basis for direct final status negotiations," but he added that a deal is "still in the process of being formalised". The Popular Front for the Liberation of Palestine (PFLP) renewed its rejection of PA's decision to return to negotiations with the occupation and called for staging protests in Ramallah and Gaza on Sunday afternoon to protest at the resumption of negotiations. The Popular Front said, in a statement, that it is organizing events and a vigil in Palestine Square in Gaza City, at 12:00 noon next Sunday. Another mass rally will be organized in Ramallah. It will be launched from the Orthodox Club Square at 1:00 pm, and will pass through Al Manara Square towards the Umam Square in front of the Muqata'a headquarters. The PFLP demanded its elements to participate in these events and called on the factions and political forces to unite in confronting the occupation and to refuse the return to negotiations. Hebrew media reported on Thursday that next Tuesday will mark the start of negotiations between the Ramallah authority and Israel in Washington DC, according to statements by Israeli Minister Silvan Shalom. PLO Executive Committee member Dr. Hanan Ashrawi met on Wednesday, with German Member of the European Parliament and the current Chairman of the European Parliament Committee on Foreign Affairs, Elmar Brok, PLO Executive Committee said in a press release. "Such commitments contribute to the achievement of a just peace on the basis of international law." 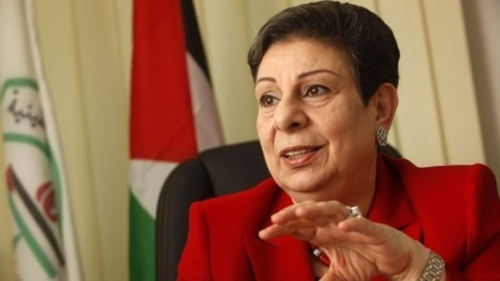 Dr. Ashrawi stressed, "We also applaud the European Parliament's decision to send a fact-finding mission to investigate the conditions of Palestinian prisoners in Israeli jails, particularly the two recent deaths of Palestinians in detention, the ill-treatment of children and women prisoners, and Israel's continued use of administration detention and torture. This will serve as a significant curb to prevent further injustice and torture of Palestinian prisoners in Israeli jails." Dr. Ashrawi specifically asked for European intervention pertaining to Israel's continued imprisonment of Palestinian parliamentarians, in particular Marwan Barghouti and Ahmad Sa'dat, and requested that Israel respect international norms dealing with the immunity of elected officials. Dr. Ashrawi also discussed the latest political developments in Palestine; she emphasized the imperative of Israel's implementation of signed agreements, especially the release all 103 prisoners detained prior to 1994 and the reopening of Palestinian institutions in Jerusalem. She added, "Israel must also abide by the June 4, 1967 boundaries as the basis for negotiations, and cease all violations of international law, including all settlement activities." "All attempts at restarting negotiations must ensure adherence to international law and the principles of justice and fairness. The occupation is a perpetual situation of oppression and injustice, and it must be brought to a rapid end," concluded Dr. Ashrawi. A new tactic by US Secretary of State John Kerry is causing a split within the Palestine Liberation Organisation (PLO) ranks regarding further talks with Israel. Kerry is apparently using the Arab League's Follow-Up Committee on the Arab Peace Initiative (FCAPI) to bully the Palestinians into accepting new ground rules for the talks to which they had objected in the past. In his sixth tour of the region as secretary of state, Kerry did something unusual. Instead of visiting Israel, as he always does, he left it out of his itinerary, deciding instead to hold most of the talks in the Jordanian capital Amman. While there, he conferred with Palestinian President Mahmoud Abbas as well as members of the FCAPI. As the talks progressed, it became clear that Kerry was no longer focussing on Israel, the country that has torpedoed all previous attempts at peace, but on the PLO. His aim is to get the latter to offer more concessions than any they have accepted in the past. In order to do this, Kerry wanted to get the FCAPI to accept these concessions on behalf of the Palestinians, a new tactic that may or may not be working but that so far has succeeded in causing divisions and widespread consternation in Palestinian circles. The tactic is not totally new, for it resonates with the manner in which US diplomats have used the Arab League to justify foreign intervention for the sake of regime change in countries such as Iraq and Libya in the past. Speaking after a meeting with Kerry in Amman, FCAPI diplomats voiced their "great support" for Kerry's efforts to revive the talks. 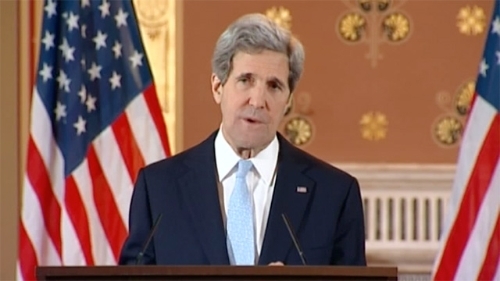 Their remarks were seen as a "victory" for Kerry, said the Associated Press. It was a "success" for his diplomacy, added The New York Times. Kerry, for his part, announced that the gap was "narrowing" between the Palestinians and the Israelis, and that all that was needed now was to "iron out" a few kinks. For the Palestinians, ironing out these kinks is going to be a quite a job, however. PLO chief negotiator Saeb Erekat is said to have had a "stormy" meeting with the PLO leadership concerning Kerry's proposals. The PLO, its back to the wall, is now forming a working committee to decide what to do about the talks. All of this is unprecedented. In the past, the FCAPI used to take its cue from the Palestinians. When the Palestinians were faced with demands for concessions they were reluctant to give, they politely said they needed to consult with the FCAPI, which was a courteous way of turning down unacceptable proposals. Now the FCAPI is getting them into trouble by agreeing to concessions before the Palestinians even have time to discuss them at length. In the absence of FCAPI support for the PLO negotiators, the latter had no option but to play along with Kerry's proposals. On Friday, the US secretary of state declared his satisfaction with the current plans to get the Palestinians and the Israelis talking again about a "final status" deal. He has invited the PLO and Israel to send negotiators to Washington soon to work out details of the agreement. PLO senior officials told the French news agency AFP that Kerry was determined to declare the resumption of the talks before leaving the region. US Department of State spokeswoman Jen Psaki told reporters that unless progress was made on Kerry's sixth visit to the region, he would not be returning for more visits. If anything, this sounds like an unveiled threat aiming to put pressure on Abbas and his chief negotiator and force their cooperation. 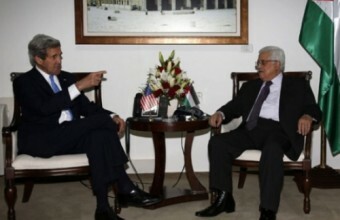 During this round of talks, Kerry also left Abbas no chance to play for time. Instead of waiting for Abbas to go to talk with the FCAPI, Kerry brought the Arab League diplomats to Amman and had them agree to his proposals without prior consultation with the PLO. In Amman, members of the FCAPI issued a statement saying that Kerry's ideas for the resumption of talks were a "suitable foundation" for further negotiations. The FCAPI stamp of approval placed the PLO in a difficult position. Abbas, unable to wiggle free from this diplomatic ordeal, remained silent. But his silence, as the saying goes in Arabic, was seen as a "sign of approval". Yet, the situation is likely to spark resentment back home, where most of the PLO leaders are opposed to Kerry's proposals. However, they know that a blunt rejection of these proposals may invoke an unpleasant US reaction, if not sanctions. Abbas is waiting to give his answer following consultations with the PLO leadership. In all likelihood, the latter will have to agree, despite its deep reservations about Kerry's proposals. As a result of all this, the FCAPI has let down the Palestinians, and it is not the first time that this has happened. On 29 April, a Qatari-led FCAPI delegation offered Kerry what amounted to its consent to a land swap at a meeting in Washington. Critics of the FCAPI correctly noted that the step was extraordinary, for the FCAPI is not empowered to make such concessions. Only the Arab summit, which issued the Arab Peace Initiative, is entitled to make any amendment to this initiative. As a mere follow-up committee, the FCAPI had exceeded its mandate. Israel, of course, is pleased to see the FCAPI offer concessions that the Palestinians do not seem willing to make. Tzipi Livni, Israel's foreign minister at the time, described the FCAPI statement as "good news." Lebanese analyst Ziad Al-Sayegh recently wrote that "after the failure of the internationalisation of the talks [through the Quartet], we are now going through a regionalisation of the talks [through the Arab League]." One symptom of this regionalisation is that the land swap, overwhelmingly rejected by the Palestinians, is now getting the Arab League's stamp of approval. Last Thursday, the Jordanian news agency Petra cited the Arab League chief, Nabil Al-Arabi, as saying that the "US plan concerning the peace process is based on three axes; political, economic and security-related". The Israeli newspaper Yediot Ahronot then offered an interesting interpretation of this statement. The political axis, it said, was the resumption of talks. The security axis was going to be left to the US top brass to decide. And the economic axis would mean a lot more aid to the Palestinian Authority. During his last tour of the region, Kerry made no reference to the Israeli settlements. Nor did he object when Israel declared plans to build 732 new settlement units in the settlement of Modi'in Illit in west Jerusalem. For him, this was not even a kink worthy of ironing out. Even worse, the FCAPI has not seemed interested in Israel's active settlement-building programme, and it did not even mention that future talks should focus on a two-state deal based on the 1967 borders. Last Friday, Kerry said that the best way to give the talks a chance was to keep them "private". He declined to reveal the details of his plan as a result, and the FCAPI had nothing to say. For now, the PLO leadership is also keeping its cards close to its chest. * This article was first published and translated from Arabic by the Al-Ahram Weekly. ** Nicola Nasser is a veteran Arab journalist based in Bir Zeit, West Bank of the Israeli-occupied Palestinian territories. 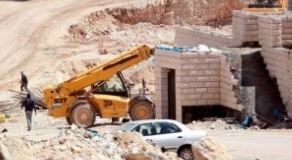 Ahmad Salah, Coordinator of the Popular Committee Against the Wall and Settlements in the Al-Khader town, south of Bethlehem, has reported that a number of settlers started the construction of two units near Boaz illegal settlement. Salah added that the settlers placed the corner stones for the new constructions on lands that belong to resident Khader Issa, in Khirbit Abu Ghlaion area. He said that the two units are being built in direct violation of a ruling by an Israeli court preventing the settlers from building in the area. Salah further stated that the area in question has been subject to frequent Israeli attacks, as the settlers illegally confiscated local Palestinian lands and repeatedly prevented the residents from entering their lands. A senior Palestinian Authority official in the occupied West Bank has reported that direct peace talks between Israel and the Palestinians, slated to start next Tuesday in Washington, cannot be held before Israel agrees to the release of all detainees held since before the first Oslo agreement of 1993. Talking on condition of anonymity, the official said that “the detainees, including those from historic Palestine and Jerusalem, must be released before talks can resume”. The official further stated that Palestinian President, Mahmoud Abbas, has repeatedly made it clear to Israel and the United States that the detainees must be freed, and must be sent back home regardless of where they live. Meanwhile, Israeli daily, Haaretz, has reported that Chief Palestinian Negotiator, Dr. Saeb Erekat, received an official invitation from the United States to start talks with Israeli Justice Minister, Tzipi Livni. Erekat said that the United States clarified that the talks are based on the Israeli withdrawal from territories it occupied in 1967. In addition, an unidentified official stated that “talks cannot resume before Israel commits itself to the release of all long term detainees, adding that “no Israeli commitment means Erekat will not be heading to Washington”. Various Palestinian officials in the West Bank stated that any partial release of old detainee would be met by public outrage, and will be viewed as forfeiting the standards and principles set by President Mahmoud Abbas and the Palestinian leadership. An official told Haaretz that Netanyahu never made a clear statement regarding peace talks based on the Israeli withdrawal from the occupied territories, never agreed to the release of the detainees, and never agreed to freeze all settlement activities. “Therefore, we cannot be talking about resuming direct talks”. He said, “We need guarantees and real commitments”. 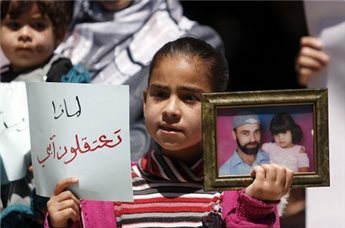 On its part, Israeli daily, Yedioth Aharonoth, quoted a Palestinian official stating that an agreement has been reached to release 103 detainees, imprisoned by Israeli before the Oslo Agreement, and that the Palestinian side is waiting for an Israel government session that will be held Sunday to vote on the issue. “Should Israel refrain from releasing the 103 detainees, including 24 from Jerusalem and the 1948 territories, the P.A will face massive public outrage should it engage in direct talks with Tel Aviv”, the official added. The same official said that talks will likely start, and that he believes Israel will release the 103 detainees on four phases starting on the first month of talks and ending on the sixth month. Yedioth Aharonoth said that Israeli Member of Knesset, Sylvan Shalom, of the Likud Party of Benjamin Netanyahu, did not void the possibility of releasing Palestinian detainees before the Fitir Muslim feast that marks the end of the current holy Muslim month of Ramadan. The decision to resume direct peace talks was declared by U.S. Secretary of State, John Kerry, who recently toured the region and held extensive talks with Palestinian, Israeli and Arab officials. He said that direct final status peace talks would start next week in Washington. Direct talks have been obstructed since September of 2009 when a temporary settlement freeze expired and Israel started massive constructions.